Daveys Hut is an Australian alpine hut in the Kosciuszko National Park. The hut was built in 1909 by grazier Tom Bolton, who moved into it with his new wife, Mary, in 1911. It is now maintained by the Kosciuszko Huts Association as a stopover for hikers, and has been listed on Australia's Register of the National Estate. Extensive repairs were carried out in 2012, replacing the wooden foundations with brick, repairing broken fittings and doors and relining an interior plywood wall. ^ "Regional State of the Environment Report 2004-2009". 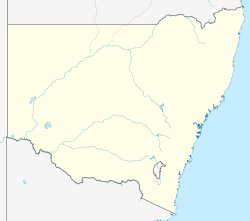 Government of the Australian Capital Territory. 14 October 2009. Retrieved 13 December 2015. ^ Dowling, Pauline (18 March 2013). "Read the Past at Daveys Hut". Snowy Times. Fairfax Media. Retrieved 13 December 2015.